as it looked round 1910. 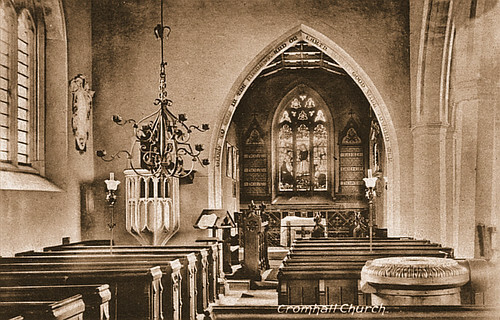 Below: an old photograph on the interior taken at roughly the same time as the exterior view. Two-tier:Upper tier contains treble on iron lowside mounted on a grillage of rolled steel joists. Remaining bells in lower tier on iron H-pattern on grillage of rolled steel joists. Fourth has canon-retaining iron headstock, though no canons to retain. The remainder have web-section iron headstocks with fixed steel gudgeons, ballbearings, traditional-type wheels, stays and sliders all by Gillett& Johnson in 1948. 1 Robert Hendley 1450 7cwt 2qtr 7lb 34"
2 Evan Evans 1742 19cwt 3qtr 21lb 481/2"
These had been rehung by Gillett & Johnson in 1948. 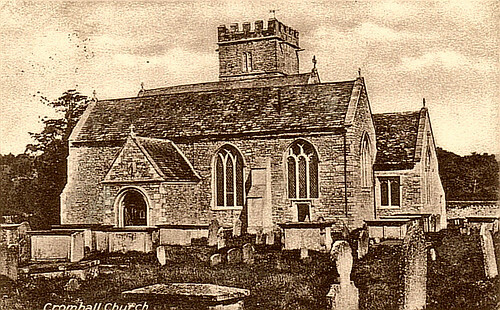 The smaller bell was initially the fourth of the new ringing peal (now weighing 7cwt 2qtr 5lb); is cracked and is now on display in the church (see photograph above). 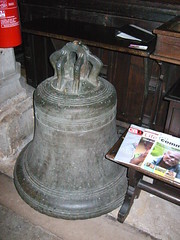 The metal from the larger bell was used towards the ringing peal.